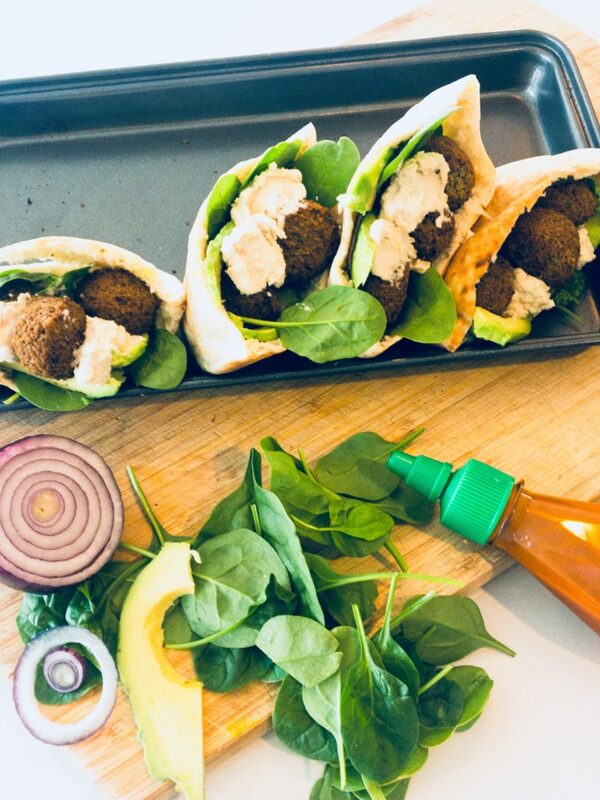 ﻿ Classic Falafel Pita Pockets - I AM Co.
We LOVE falafels! They’re pretty easy to make and you there’s so many ways to enjoy them. On their own dipped in hummus & sriracha, part of a platter, on top of a salad or throw them in a lightly toasted pita with a bunch of fresh spinach. Delicious! If you get the opportunity we suggest you double the recipe and once cooked & cooled, freeze them for a quick n’ easy midweek meal. Add all ingredients except the oil into a food processor and pulse until well combined. You don’t want large chunks of chickpea & onion so this may take a few a few turns, scraping down the sides every time you stop. Now, it’s important to taste and see if the seasoning is right. Adjust if needed and place into the freezer for 10-15 minutes to firm up. Take spoonfuls of the mixture and mould into small discs in your hands. If it’s took sticky you may need to add a touch more flour, it it’s not quite holding together it may need a few more pulses in the food processor. Once all of your falafels are formed heat enough oil to cover the bottom of a large frying pan to a med-high heat. Place falafels into the pan, careful not to overcrowd them and cook for 2-3 minutes on each side. Remove from the pan when they are done and place on absorbent paper while you continue to cook the remaining falafels. Now it’s time to get creative, serve in the pitas with the salad and condiments listed above or toss through a salad with feta and a tomato salsa. The options are endless.